A form of massive calcium carbonate, CaCO 3 , resulting from deposition by springs or rivers. It is often beautifully colored and banded as a result of the presence of iron compounds or other (e.g., organic) impurities. This material is variously known as calc-sinter and calcareous tufa and (when used for decorative purposes) as onyx marble, Mexican onyx, and Egyptian or Oriental alabaster. 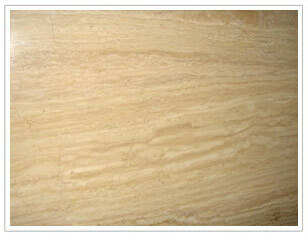 Travertine is generally less coarse-grained and takes a higher polish than stalactite and stalagmite, which are similar in chemical composition and origin.